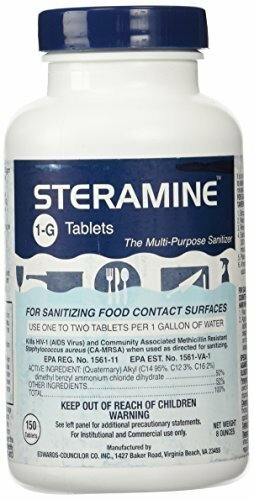 Case of STERAMINE 1-G Sanitizing Tablets - 150 Tabs per bottle - 6 bottles in case Each Bottle makes 150 gallons of cleaning solution - Used by Restaurants & Bars Worldwide! Commercial strength but also makes a great economical household sanitizer! One bottle makes 150 gallons of Quaternary solution! Just 1 tablet per gallon of water! Odor Free, Non corrosive, does not irritate the skin ! May also be applied with a clean cloth or sponge. Works great in Kitchens & Bathrooms! Can be sprayed on Food processing equipment, sinks, countertops, cabinets, refrigerators, stovetops, cutting boards, and all other non-porous articles and surfaces. STERAMINE 1-G Sanitizing Tablets - 150 Tabs per bottle Makes 150 gallons of cleaning solution - Used by Restaurants & Bars Worldwide! 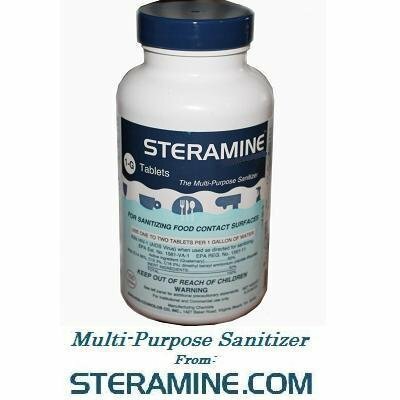 Commercial strength but also makes a great economical household sanitizer! One bottle makes 150 gallons of Quaternary solution! Just 1 tablet per gallon of water! Odor Free, Non corrosive, does not irritate the skin ! May also be applied with a clean cloth or sponge. Works great in Kitchens & Bathrooms! Can be sprayed on Food processing equipment, sinks, countertops, cabinets, refrigerators, stovetops, cutting boards, and all other non-porous articles and surfaces. 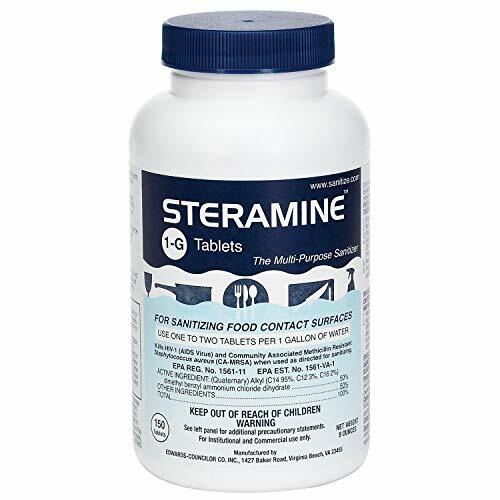 Case of STERAMINE 1-G Sanitizing Tablets - 150 Tabs per bottle - 6 bottles in case Each Bottle makes 150 gallons of cleaning solution - Used by Restaurants & Bars Worldwide! 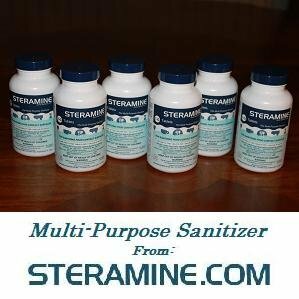 Commercial strength but also makes a great economical household sanitizer! One bottle makes 150 gallons of Quaternary solution! Just 1 tablet per gallon of water! Odor Free, Non corrosive, does not irritate the skin ! May also be applied with a clean cloth or sponge. Works great in Kitchens & Bathrooms! Can be sprayed on Food processing equipment, sinks, countertops, cabinets, refrigerators, stovetops, cutting boards and all other non-porous articles and surfaces. 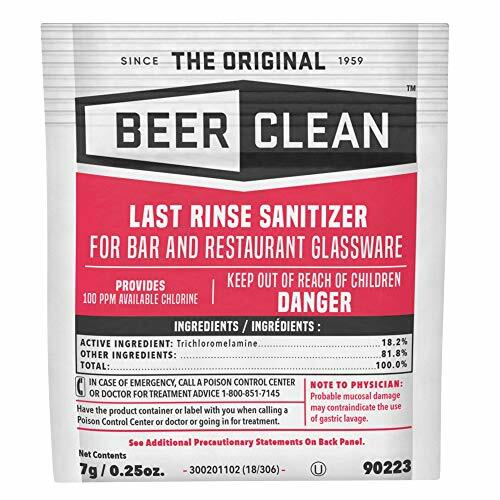 Choose a tried-and-true glassware sanitizer that's trusted by and used in breweries throughout North America. Powdered compound contains trichloromelamine (TCM), ensuring effective sanitization of all glassware. Laboratory tested—kills E. coli and staph. Formulated for use in cold water. These convenient tablets eliminate the handling and storage of bulky sanitizers. They end guesswork in measuring and prevent loss from breakage, spillage or waste. 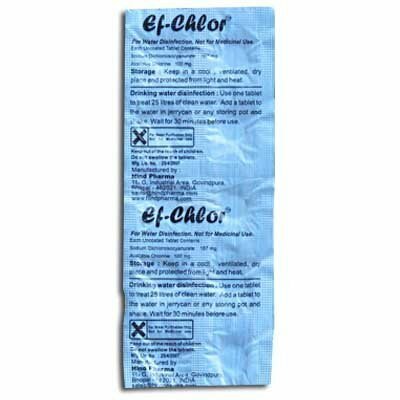 The tablets dissolve in water producing a distinct, clear, pale blue sanitizing solution that tells operators and inspectors at a glance that this sanitizer is in the final rinse sink. Sanitizing solutions are long-lasting and usually remain effective all day. All of these advantages are available at an economical cost of only pennies per gallon.